I'm making forms that allow customers to get quotes on complicated products. Therefor there are a lot of conditional fields within my forms that do not need to be filled out. 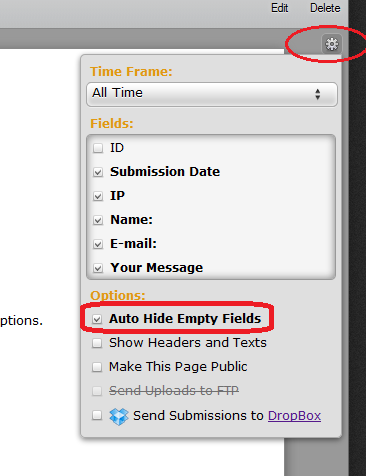 >> How can I have these empty fields withheld from the report generated for the auto-response and email notifications? This is probably the best example of a form that has A LOT of empty fields depending on the path the customer takes. FORM << Check out the "Thank You" and "Award Plaques" Auto-responses. There's actually another alternative which was recently posted on the forum by a couple of my colleagues. To demonstrate, complete just a couple questions (the Direct e-mail address field and any other) in this form and submit it. You'll see that although the form has several fields, only those you completed (plus the phone number and date) show up in the auto-response. If you would like info on how to implement this method, we'd be happy to help. Genius! Thank You very much Wayne. My web guy is out of town for a week but I look forward to showing him this post and giving it a try. I'll be sure to let you know how it goes.